Last week, the Honduran Institute of Anthropology and History announced an important discovery in the Copán Archeological Park, located in western Honduras, which continues to boostHonduras’ position as the destination with the most diverse tourism offering in Central America, due in part to its rich history. The discovery, considered one of the most important in recent years, features various burial sites that may have belonged to prominent members of Copán aristocracy, part of the Mayan civilization. 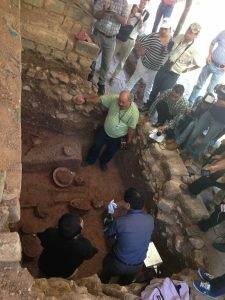 Important pieces including colorful ceramic pots, jade pectoral, spondylus shells and other items with great historical value, were found at the site, as well as, traces of funeral rituals involving fire, that contribute new evidence to continue unraveling the history of the Mayan civilization that inhabited Copán. According to the preliminary analysis these burial sites are from the sixth century, between 500 and 550 A.D. Judging by the rich offerings found at the site and the results of previous findings in the area, researchers believe that individuals buried there were members of Copán high society, possibly of the Copán dynasty. Research director, archeologist, Seiichi Nakamura, professor at the University of Kanazawa in Japan, expressed that these burial sites were for sacrifices or offerings for other important burials. The Honduran Institute of Anthropology and History leads archaeological research and the conservation of structures through a grant from the Japanese government. The area of study is located 150 meters north of the Grand Plaza at Copán, where 150 burial sites have been discovered to date, including one of a 12 to 13 year-old child, who was most likely a member of Copan’s royal family in the sixth century. The discovery site will remain open for tours, a new attraction at the Copán Archaeological Park. The tours will be introduced by the Honduran Institute of Anthropology and History and visitors will be able to witness the excavations and conservation of archaeological findings firsthand.